With nominations for Best Law Firm and Best Attorney, Ball Morse Lowe, PLLC. is pleased to represent leading law firms in the Norman Transcript’s 2019 Reader’s Choice Awards. With previous year’s awards also including “Best Places to Work,” BML is grateful for the community continuously supporting the company. Following the preliminary rounds, Ball Morse Lowe ranked top five amongst top law firms and attorneys in the Norman, Oklahoma area. Our growing law firm would not be able to do with without the support of astounding clients and supporters. Bow Bottomly, our leading family law attorney, represented Ball Morse Lowe through his nomination as Best Attorney. In previous year Bow has been voted one of the top five family law attorneys in Oklahoma by the Oklahoman. The Norman Transcript nominates multiple service providers in the Norman area for annual awards in a variety of awards and categories. The nominees are voted on by the local community during the month of February. Ball Morse Lowe is honored to be continually nominated for these awards and aims to provide top quality legal guidance in order to maintain support and recognition within the community. 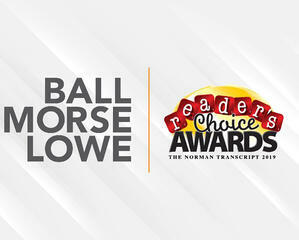 For more information on the Reader’s Choice Awards or BML, please contact us at 405-701-5355. © 2019 | by Ball Morse Lowe, PLLC. All rights reserved.